Figure 1. Stalk and ear rot diseases may become more evident in fields with standing water. Monitor for weakened stalks and evidence of ear rot diseases. Flooding and saturated soils in some parts of the state following recent heavy rains is like adding insult to injury (literally) to corn that may still be suffering the effects of severe weather earlier in the season. Late season ponding can exacerbate some diseases that can complicate harvest and/or storage. The length of time that plants stand in water or saturated soil will also likely impact the severity of these diseases, especially if plants are prematurely killed. Stalk and ear rot diseases are the most common diseases that can develop in corn that was impacted late season by excessive rainfall. Wet growing conditions promote growth and infection by several pathogens in the soil. Weakened plants can be overtaken by infections that have occurred already or by new infections. 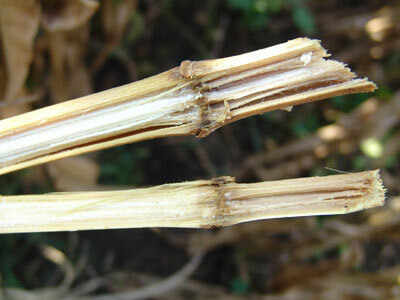 Degradation of the inside of stalks weakens them and predisposes plants to lodging. There is nothing that can be done at this point in the season to stop stalk rot diseases as stalks will continue to degrade over time, further weakening them. But, you can minimize your losses by identifying which field(s) have the worst stalk rot diseases and adjust the harvest order of those fields. Consider harvesting those fields that are heavily impacted by stalk rots first or early to minimize losses after lodging. Infection and decay of the crowns or stalks of the plants can stop water movement up the plant and hasten plant death. In addition, anaerobic conditions created by prolonged ponding for more than a few days will also prematurely kill plants. Plants that die before reaching physiological maturity and forming their abscission layer (more commonly called "black layer") on the kernels are especially prone to ear rot diseases. Affected field areas should be scouted to monitor for stalk and ear rot diseases. The first indication of a problem in corn may be rapid changes in plant color as plant processes shut down. Stalk strength can be assessed using the "push or pinch" test by walking a portion of the field and pushing plants at arm's length. Those that don't snap back upright and bend below the ear are prone to lodging. Alternatively, you can squeeze the lower stalks of plants (between the nodes) to determine the relative stalk strength, identifying how many are easily crushed by hand. It is important to test a large enough area of the field to determine a representative sample size. Checking a minimum of 100 plants is probably necessary. Similarly, corn ear quality should also be assessed. The first indication of ear rot diseases is often an early discoloration of the husks from green to a tan/straw color. Inside the husks look for cottony white or colored dusty fungal growth that can indicate fungal contamination. Ear rotting fungi can discolor kernels, cobs, or ear shanks and may be diagnostic clues as well as to which diseases are present and whether there's also a risk for mycotoxin production. Because these fungi will continue to grow during storage in the bin, it may be important to handle or store affected corn differently. Grain affected by ear rot diseases should not be stored if it can be avoided, so plan to use or sell affected grain as quickly as possible during or after harvest. If you plan to store grain that is or may be affected by ear rot diseases, it is important to cool and dry the corn as quickly as possible to slow mold growth in the bin.